To make the jam, place the tomatoes, ginger, garlic and chillies in a food processor and blend until fairly smooth. Transfer to a medium saucepan and add all the remaining ingredients. Bring to the boil, reduce the heat and simmer for 30-35 minutes until thickened and glossy, stirring occasionally. Allow to cool.  Place the sausages under a preheated moderate grill or barbecue and cook for 7-8 minutes on each side or until cooked through. 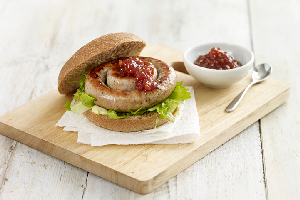 Arrange some shredded lettuce on the base of the rolls, then top with the sausage rings and a generous spoonful of the jam. Serve immediately. *For a less spicy jam, remove the seeds from the chillies. Any remaining jam can be stored in the fridge for up to 1 week. Heat the oil in a large pan with a lid, then brown the sausages on all sides. Remove from the pan. Add the onions, bacon and garlic, to the pan and cook over a moderate heat for 3-4 minutes until softened. Stir in the paprika, red wine, tomato purée, chopped tomatoes, stock, rosemary and beans. Bring to the boil, then reduce the heat and return the sausages to the pan. Season with freshly ground black pepper and cover and simmer for 30 minutes, stirring occasionally. Serve with warm garlic bread. Preheat the oven to 190°C, Gas mark 5. Pour the oil onto a baking tray and heat in the oven until hot. Add the potato wedges, toss to coat in the oil and season with salt and freshly ground black pepper. Then add the sausage. 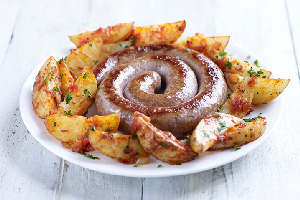 Cook in the oven for 35-40 minutes, turning the sausage once and the wedges form time to time, until golden. Ten minutes, before the end of the cooking time, make the sauce. Heat the oil in a saucepan and cook the onion for 5 minutes, until softened. Stir in all the remaining ingredients and bring to the boil. Simmer, uncovered for 10 minutes until thick and pulpy, stirring occasionally. Remove the sausage from the tray onto a serving dish. Spoon the sauce over the potatoes and stir until evenly coated, then pile onto the serving dish and sprinkle with the parsley. 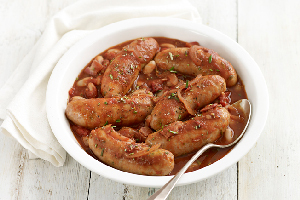 Chop the sausage into pieces and serve immediately. Preheat the oven to 220°C, gas mark 9. 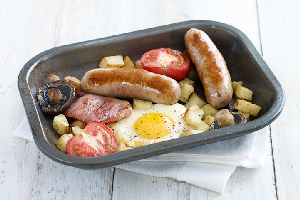 Generously brush a 8-hole Yorkshire pudding tray, (about 9cm wide) with oil then add 2 sausages to each. Place in the oven and cook for 5 minutes until lightly browned. Meanwhile place the flour in a large bowl and season with a little salt and freshly ground black pepper. Make a well in the centre. Whisk the milk, mustard, herbs and eggs together, then pour a third of the mix into the well. Gradually draw the flour into the milk to form a paste, then whisk in the rest of the milk to make a smooth batter. Remove the sausages from the oven, then pour the batter over each. Return to the oven and cook for 20 minutes, or until the batter is risen, golden and crisp. 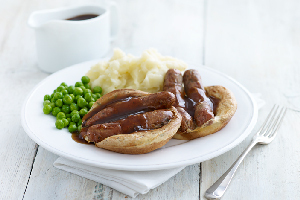 Serve immediately with mashed potato, peas and gravy. Heat the oil in a large frying pan and cook the onion over a low heat for about 20 minutes, stirring often, until they are soft and starting to turn golden. Don't be tempted to turn the heat up or they'll burn. Add the sugar and balsamic vinegar and cook for another 5 minutes, stirring often, until they are caramelized. Meanwhile cook the sausages under a preheated hot grill or barbecue for 5-6 minutes each side, until golden and cooked through. 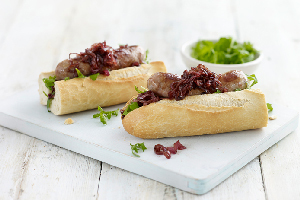 Split each roll and top with a handful of rocket, a steak sausage and a generous helping of the sticky onions. Preheat the oven to 200°C,Gas Mark 6. Place the oil in a non- stick ovenproof dish or roasting dish and heat in the oven until hot. Add the sausages and potatoes and turn to coat in the oil. Cook for 15 minutes, then remove from the oven and turn the sausages and potatoes. Add the mushrooms and turn to coat in the oil, then add the rashers of bacon and tomatoes. Return to the oven and cook for a further 10 - 12 minutes, until the potatoes are golden and sausages cooked through. Remove and turn the bacon, then make 2 gaps and break in the eggs. Return to the oven and cook for 3-4 minutes, until the eggs are softly set. Serve immediately with freshly ground black pepper.